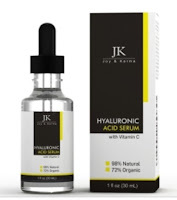 What I love about Hyaluronic acid serum is its ability to take dry, dull skin and make it feel more hydrated and much softer. Hyaluronic acid has the ability to attract moisture to the skin (it's a humectant) and it holds 1000x times its own weight in water. This means that skin that is even extremely dry and parched will benefit from this serum. All you have to do is apply it after cleansing prior to other drums and definitely before your moisturizing cream. Joy and Karma Hyaluroinic Serum was made with 72% organic ingredients and does not have any parabens, petrochemicals, phthalate sand sulfates that are often found in other products. Skin will glow, look vibrant, feel pampered and feel well hydrated. It improves skin's elasticity, firmness and helps to reduce free radical damage. Skin is plump and looks radiant.